WHAT? YOU DON'T USE A FACE MIST? Revitalizing new facial sprays you need for happier skin, hot weather or not. 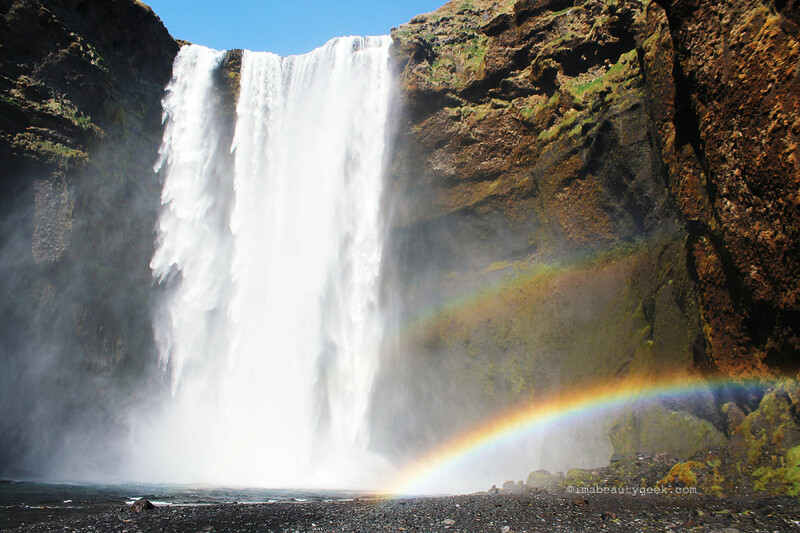 In the sad dearth of grown-up splash pads, giant sit-around fountains, walk-in Icelandic waterfalls, or skip-through lawn sprinklers on every city block, refreshing facial mists can really make a happy difference on humidity-drenched summer days. With regular use, they can kick up your complexion&apos;s hydration levels, temper oiliness and turn up your glow, and the how-to is pretty easy to figure out. 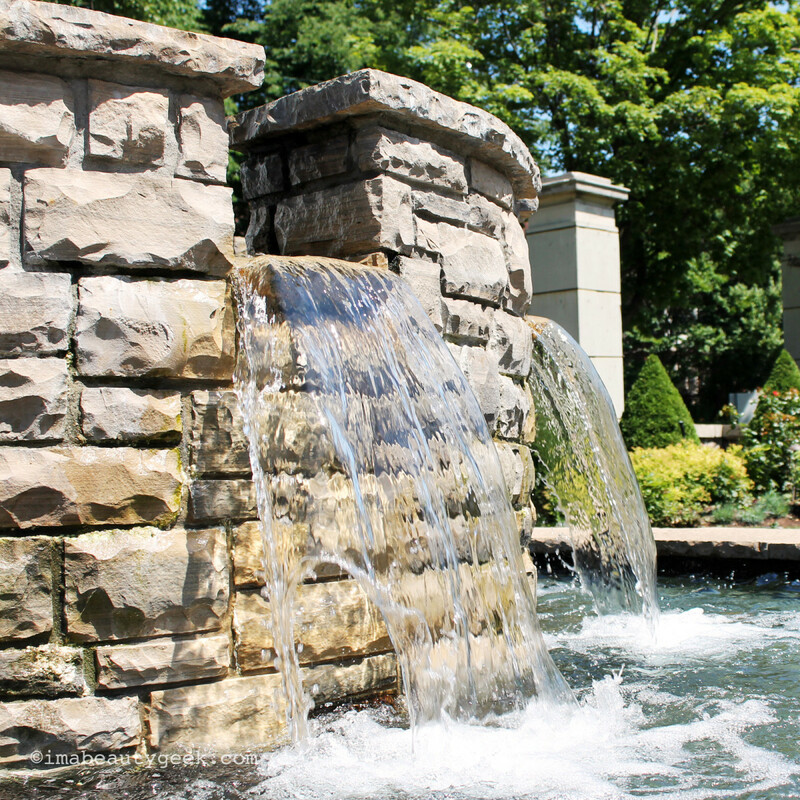 On mug-tastic days, I just want to stick my head under a fountain, like this one at Toronto&apos;s Casa Loma. I did a face mists 101 post a while back, and this Mist-Hits post before that, both with tips on different types and how to use each of them. For convenience, though, I&apos;ll just do a quick instructions re-cap here. Unless the directions on the bottle say otherwise, mist on clean skin morning and night before applying serum. A little moisture on the skin&apos;s surface boosts hydration and helps skin absorb the serum you put on top. Mist over makeup to set application and reduce a powdery finish. Mist over face as needed throughout the day. a) If your face mist is just water (as in La Roche-Posay or Avene thermal water, or Evian), let it sit for a minute, then dab the excess off with a napkin or tissue. Water evaporates quickly and draws water from your skin with it. b) Face mists with botanical oils in the ingredient list can stay on skin without drying it out. 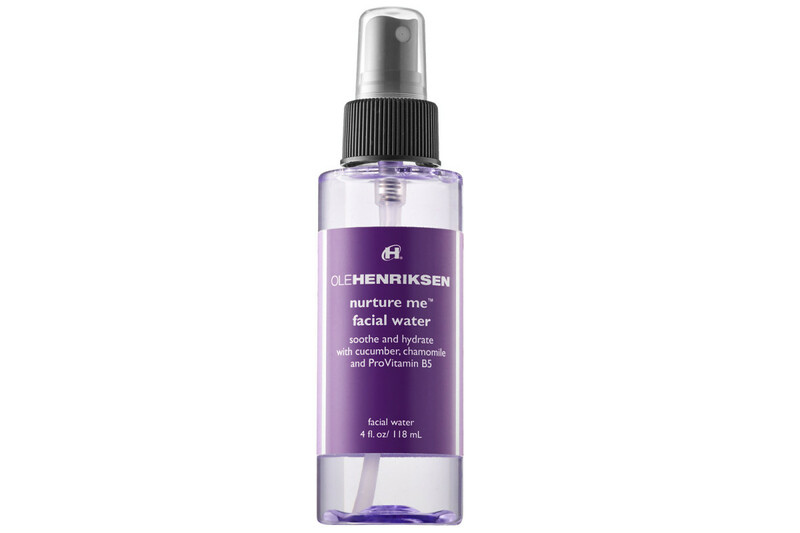 Some face mists are designed to manage oiliness over time; no need to dab those off your skin either. Scent is a consideration if you have super-sensitive or reactive skin (or are planning to use them mid-flight on a crowded aircraft). The best facial mists in these cases would be gentle thermal water sprays from La Roche-Posay or Avène. Bonus: they&apos;re much less expensive than some of the fancier facial mists on the market. The touch of orange-citrus scent in Bliss Triple Oxygen Radiance Restoring Mist ($47 CAd at sephora.com and $38 USd at blissworld.com) makes it one of my favourites. Of course it&apos;s wonderfully refreshing, and it makes my skin feel immediately less oily. The only downside is that I tend to spray this one super generously because I like the delicate fragrance so much, and at that price... eek! If you&apos;ve tried the Tarte Rainforest of the Sea Marine Boosting Mist ($30 CAd and $25 USd at sephora.com), you know it has an orange-y citrus scent as well, but the Bliss Triple Oxygen Radiance Restoring Mist fragrance is lighter and airier. While I like the Tarte mist too, I don&apos;t use it quite as generously because the scent is stronger and sweeter. 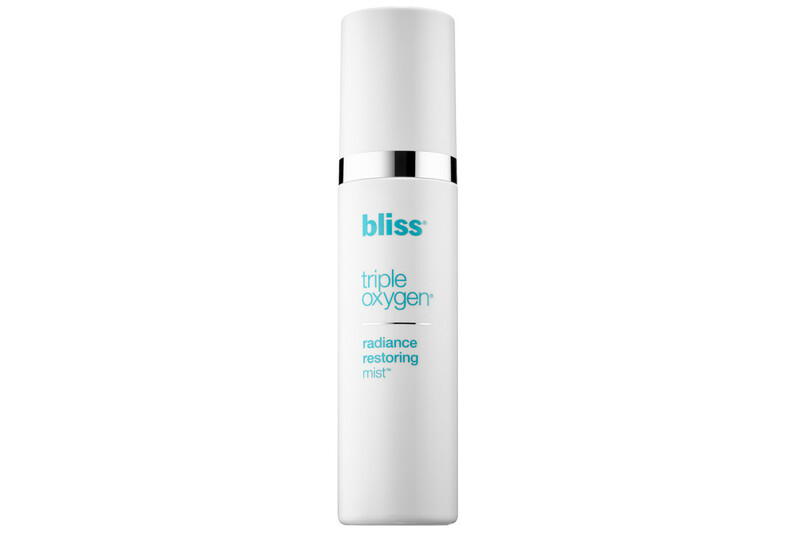 Bliss Triple Oxygen Radiance Restoring Mist ingredients: Water, Alcohol Denat., Ascorbyl Glucoside, Chamomilla Recutita (Matricaria) Flower Extract, Cucumis Sativus (Cucumber) Fruit Extract, Glycyrrhiza Glabra (Licorice) Root Extract, Hydrolyzed Soy Protein, Sodium Hyaluronate, Vaccinium Macrocarpon (Cranberry) Fruit Extract, Tetrahexyldecyl Ascorbate, Hydrolyzed Wheat Protein, Euterpe Oleracea Fruit Extract, Punica Granatum Extract, Vitis Vinifera (Grape) Seed Extract, Lepidium Sativum Sprout Extract, Allium Sativum (Garlic) Bulb Extract, Panax Ginseng Root Extract, Glycerin, Tropolone, Glycine Soja (Soybean) Oil, Tocopherol, Lecithin, Tripeptide-1, Peg-40 Hydrogenated Castor Oil, Peg-8 Dimethicone, 1,2-Hexanediol, Caprylyl Glycol, Fragrance (Parfum), Phenoxyethanol, Perfluorohexane, Hydrogenated Lecithin, Perfluoroperhydrophenanthrene, Perfluorodecalin, Decarboxy Carnosine Hcl, Butylene Glycol, Xanthan Gum, Tetrahydrodiferuloylmethane, Sodium Benzoate, Perfluorodimethylcyclohexane, Ethylbisiminomethylguaiacol Manganese Chloride, Tetrahydrodemethoxydiferuloylmethane, Tetrahydrobisdemethoxydiferuloylmethane, Cyclodextrin, Limonene, Linalool, Citral. 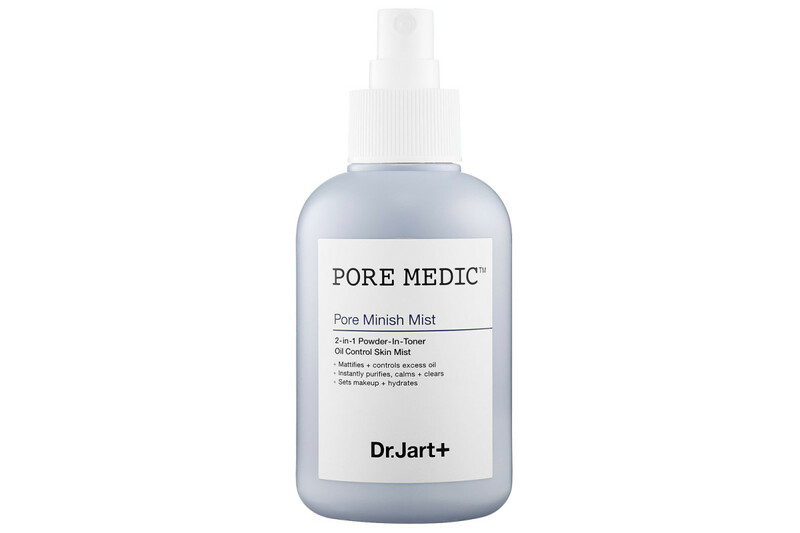 I&apos;m waiting for my Dr. Jart+ Pore Medic Pore Minish Mist ($38 CAd and $30 USd at sephora.com) to arrive from Sephora. I&apos;m keen to try it because it&apos;s alcohol-free and supposed to mattify the skin (it contains oil-absorbing kaolin clay and magnesium aluminum silicate as well as astringent witch hazel). If it works well, I&apos;ll have to let our Cranky Beauty Pants give it a go – her complexion is oily too. If you&apos;ve tried it, please dish in the comments! Dr. Jart+ Pore Medic Pore Minish Mist ingredients: Water, Dipropylene Glycol, Butylene Glycol, PPG-26-Buteth-26, PEG-40 Hydrogenated castor oil, Betaine, Sodium Chloride, Caprylyl Glycol, Ethylhexylglycerin, Citrus Paradisi (Grapefruit) Fruit Extract, Citrus Junos Fruit Extract, Eucalyptus Globulus Leaf Extract, Eugenia Caryophyllus (Clove) Flower Extract, Sophora Angustifolia Root Extract, Zinc Oxide, Panthenol, Kaolin, Magnesium Aluminum Silicate, Dipotassium Glycyrrhizate, Fragrance, Hamamelis Virginiana (Witch Hazel) Water, Portulaca Oleracea Extract, Fomes Officinalis (Mushroom) Extract, Enantia Chlorantha Bark Extract, Oleanolic acid, Sodium Polystyrene Sulfonate, Sorghum Bicolor Stalk Juice, Glycerin, Sericin, Rhus Semialata Gall Extract, Betula Platyphylla Japonica Juice, Rosmarinus Officinalis (Rosemary) Leaf Extract, Salvia Officinalis (Sage) Leaf Extract, Lavadula Angustifolia (Lavender) Flower/Leaf/Stem Extract, Anthemis Nobilis Flower Extract. 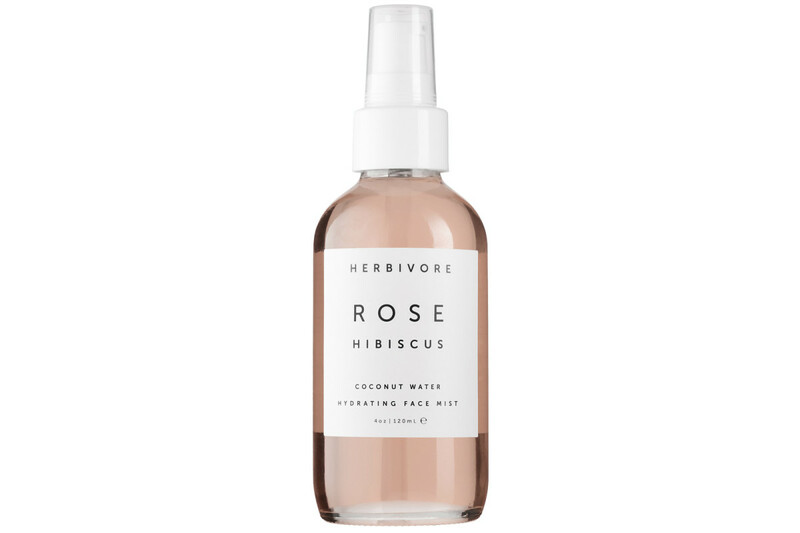 I haven&apos;t tried the Herbivore Rose Hibiscus Coconut Water Hydrating Facial Mist ($34 CAd and $32 USd at sephora.com), but I&apos;m keen to. What calls to me most about this alcohol-free formula is its short ingredient list. Unfortunately I spotted this mist after I&apos;d finished my sephora.com spender, so I have to wait until my budget-bruised wallet recovers before I can acquire it. If you&apos;ve tried it, tell me everything please! Herbivore Rose Hibiscus Coconut Water Hydrating Facial Mist ingredients: Water, Cocos Nucifera (Coconut) Water, Hamamelis virginiana (Witch Hazel) Distillate, Aloe Barbadensis Leaf Water (Aloe Water), Hibiscus Flower Extract, Bulgarian Rose Oil, Grapefruit Oil, Lactobacillus Ferment. 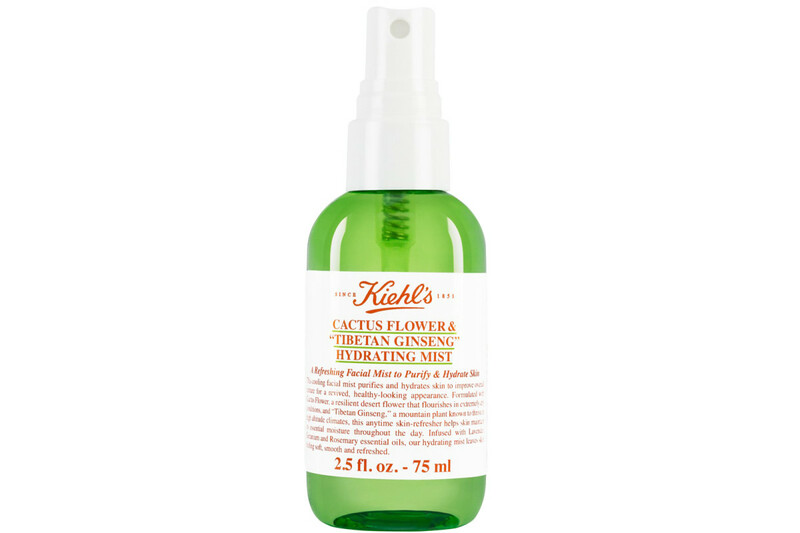 Although new to North America, Kiehl&apos;s Cactus Flower & Tibetan Ginseng Hydrating Mist ($22 CAd at Kiehl&apos;s boutiques and $17 USd at kiehls.com) has been around since 2012 as part of a Kiehl&apos;s Travel Tested Solutions kit. Apparently it&apos;s been tested on flight crews from Air China, Air Hainan, China Eastern and China Southern airlines, and should deliver up to eight hours of boosted hydration. Available on its own as of this year in North America, it hit shelves at all Canadian Kiehl&apos;s locations just last week and should be available at kiehls.ca any minute. Out of all the new facial sprays I&apos;ve tried this year so far, the Laneige Brightening Sparkling Capsule Mist ($36 CAd at sephora.com and $27 USd at amazon.com) is my favourite. My skin just feels so clean after I use it. Maybe it&apos;s the wee hit of carbon dioxide from the included fizzy water tablets you drop into the bottle before using it. Maybe it&apos;s the exfoliating blend of fruit AHAs, although that needs time to work its skin-clearing magic. Maybe it&apos;s the faint instant-fade clean fragrance. Whatever it is, I dig it. I do wish it were less expensive, though. 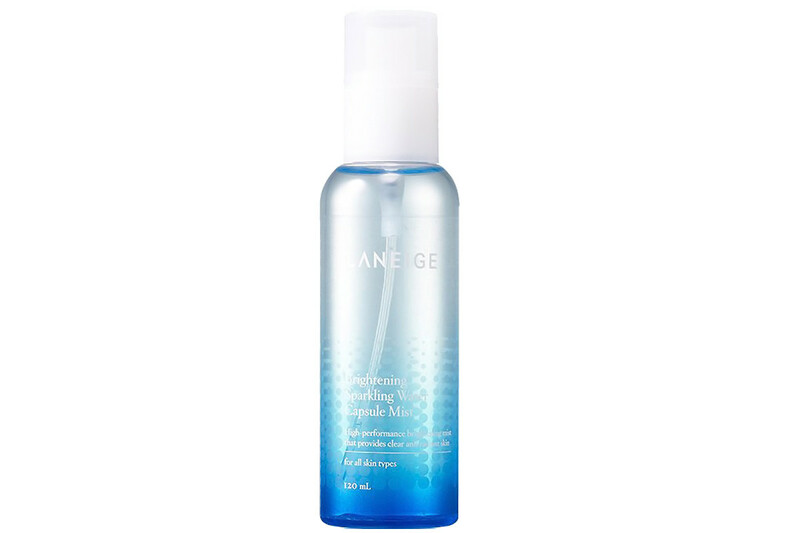 Laneige Brightening Sparkling Capsule Mist ingredients: Water, Butylene Glycol, Alcohol, Phenoxyethanol, Octyldodeceth-16, Carbon Dioxide, Ethylhexylglycerin, Peg-60 Hydrogenated Castor Oil, Fragrance, Benzophenone-5, Disodium Edta, Vaccinium Myrtillus Fruit/Leaf Extract, Saccharum Officinarum (Sugar Cane) Extract, Citrus Medica Limonum (Lemon) Fruit Extract, Citrus Aurantium Dulcis (Orange) Fruit Extract, Acer Saccharum (Sugar Maple) Extract. 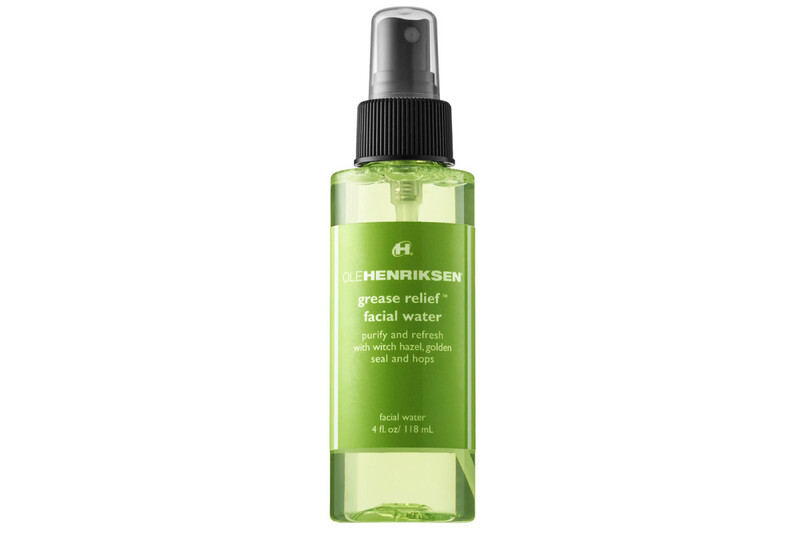 Ole Henriksen Grease Relief Facial Water ($28 CAd and $22 USd at sephora.com) is one of those face mists that you don&apos;t just spray on your face. Bottle directions advise spraying onto a cotton pad and wiping on skin, maybe because with ingredients like lactic acid and glycolic acid, you mightn&apos;t want to get it in your eyes. Makes me wonder why it&apos;s in a spray form, but no matter. I like it because it has those skin-smoothing ingredients as well as a bunch with hydrating properties – *waves hi to glycerin and hyaluronic acid* – and a hit of peptides. It&apos;s also alcohol-free if that&apos;s something you look for. The scent is more medicinal than not, but not unpleasant. I don&apos;t find Grease Relief mattifying, but I don&apos;t think that&apos;s an instant thing with this mist. A reduction in excess sebum is something that happens over a few weeks and with supporting skincare. I&apos;ve got Cranky Beauty Pants on testing duty on this one too, and am looking forward to her take as well as yours if you&apos;ve tried it. Ole Henriksen Grease Relief Facial Water ingredients: Water, Adipic Acid/Neopentyl Glycol Crosspolymer, Aminomethyl Propanol, Biosaccharide gum-1, Glyceryl Polymethacrylate, Polyacrylate Crosspolymer-6, Lactic Acid, Glycolic Acid, Glycerin, Glucosamine HCL, Polysorbate 20, Avena Sativa (Oat) KernelExtract, PEG-8, Menthyl Ethylamido Oxalate, Pisum sativum (Pea) Extract, Arginine, Hydroxyethyl Acrylate/ Sodium Acryloyldimethyl Taurate Copolymer, Bambusa vulgaris stem/leaf extract, Dimethicone, Panthenol, Polyisobutene, VP/VA Copolymer, Chondrus Crispus (Carrageenan), Hydrolyzed hyaluronic acid, Mica, Sorbitol, Glycine, Amodimethicone,Hydroxypropyl Methylcellulose, Titanium Dioxide, PEG-7 Trimethylolpropane Coconut Ether, Sodium Hyaluronate, Calendula Officinalis Flower Extract, Cucumis Sativus (Cucumber) Fruit Extract, Sea Salt, Copper Tripeptide-1, Hydrolyzed Soy Protein, Palmitoyl Oligopeptide, Potassium Sorbate, Ethylhexylglycerin, Phenoxyethanol, Fragrance. Come Fall and winter, I&apos;m really going to like Ole Henriksen Nurture Me Facial Water ($28 CAd and $22 USd at sephora.com). The moisturizing, alcohol-free formula includes glycerin, aloe leaf juice, calming allantoin, panthenol, cucumber extract, chamomile extract and apricot kernel oil. I&apos;m not such a fan of the cucumber-ish fragrace, though – it&apos;s a little strong, although it doesn&apos;t last long. Ole Henriksen Nurture Me Facial Water ingredients: Water, Hamamelis Virginiana (Witch Hazel) Extract, Glycerin, Polysorbate 20, Aloe Barbadensis Leaf Juice, Allantoin, Panthenol, Cucumis Sativus (Cucumber) Fruit Extract, Panax Ginseng Root Extract, Chamomilla Recutita (Matricaria) Flower Extract, Oleth-20, Prunus Armeniaca (Apricot) Kernel Oil, Potassium Hydroxide, Caprylyl Glycol, Ethylhexylglycerin, Hexylene Glycol, Benzoic Acid, Citric Acid, Phenoxyethanol, Fragrance, Geraniol, Linalool, Hydroxycitronellal, Butylphenyl Methylpropional,Citral, Limonene. Sensitive skin might have a bit of trouble with Ole Henriksen Truth Facial Water ($28 CAd and $22 USd at sephora.com). Mine was having a dehydrated day for some reason or other; my first misting of Truth Facial Water made my face sting. A second try a few days and more hydration later, though, and no problem. This mist contains green tea (camellis sinensis), chamomile, rooibus, and pomegranate extracts, plus moisture-luring glycerin. I wish I liked the scent more, though. It&apos;s citrus, but that sweet orange rather than just-peeled. Perhaps that&apos;s a good thing for you? 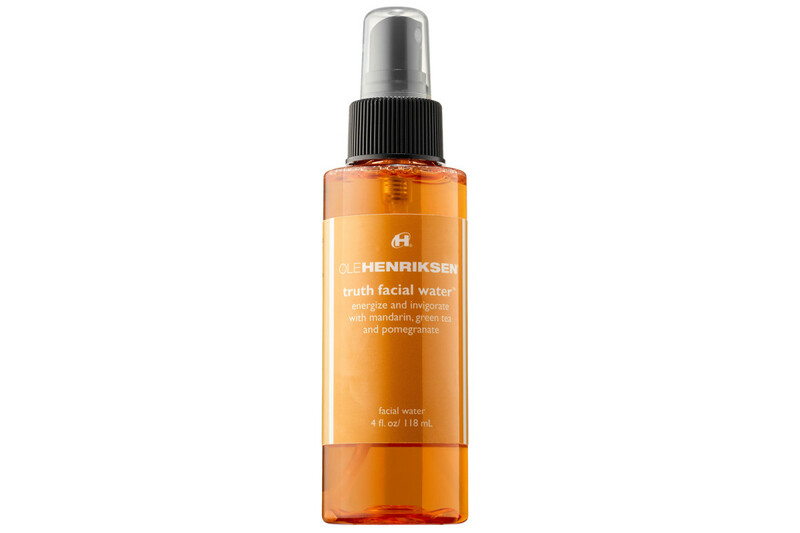 Ole Henriksen Truth Facial Water ingredients: Water, Sodium PCA, Betaine, Panthenol, Camellis Sinensis Leaf Extract, Chamomilla Recutita (Matricaria) Flower Oil, Aspalathus Linearis Leaf Extract, Punica Granatum Extract, Anthemis Nobilis Flower Extract, Allantoin, PPG-5-Ceteth-20, Glycerin, Sodium Benzoate, Potassium Sorbate, Phenoxyethanol, Fragrance, Citrus Aurantium Dulcis (Orange) Oil, Citrus Nobilis (Mandarin Orange) Oil, Citric Acid, Limonene. Man, I wish I hadn&apos;t looked at the Nordstrom Anniversary Sale stuff. That&apos;s where I saw this, along with the Gifts with Purchase section that makes my wallet tremble. Philosophy Renewed Hope in a Jar Microrenewal Hydrating Facial Mist ($32 CAd at sephora.com and $30 USd at nordstrom.com) launched a while back, but I haven&apos;t tried it. I&apos;m tempted though, because I dig stuff that contains exfoliating ingredients such as glycolic and mandelic acids, plus moisture-greedy hyaluronic acid. 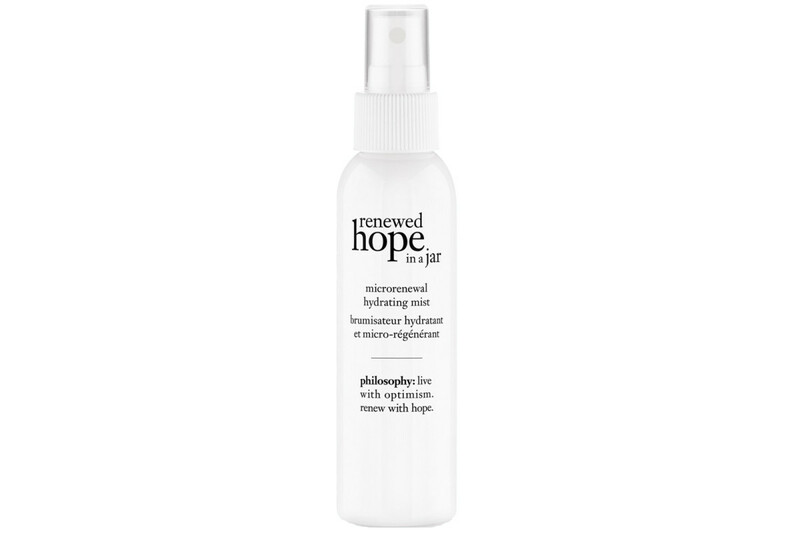 Philosophy Hope in a Jar Microrenewal Hydrating Facial Mist ingredients: Water, Butylene Glycol, Caprylic/Capric Triglyceride, Glycerin, Peg-60 Hydrogenated Castor Oil, Caprylyl Glycol, 1,2-Hexanediol, Cyclopentasiloxane, Chlorphenesin, Parfum/Fragrance, Pentylene Glycol, Dimethiconol, Acrylates/C10-30 Alkyl Acrylate Crosspolymer, Adenosine, Sodium Hyaluronate, Sodium Hydroxide, Phenoxyethanol, Limonene, Citral, Citric Acid, Mandelic Acid, Tocopheryl Acetate, Ethylhexyl Palmitate, Propanediol, Glycolic Acid, BHT, Evodia Rutaecarpa Fruit Extract, Faex/Yeast Extract/Extrait De Levure, Opuntia Coccinellifera Flower Extract, Silica Dimethyl Silylate, Ethylhexylglycerin, Hyaluronic Acid, Silanetriol, Sorbic Acid, Hexylene Glycol, Titanium Dioxide (Ci 77891). I&apos;m not fully sold on the anti-pollution benefits of a face mist – if you wear antioxidant-infused moisturizer and sunscreen and makeup, you&apos;ve already got a shield in place against environmental undesirables. But I suppose a little extra help via REN Flash Defence Anti-Pollution Mist ($48 CAd and $38 USd at sephora.com) wouldn&apos;t hurt if your budget can take it – the bottle is only 60 mL. The alcohol-free formula contains an ingredient that is supposed to help damaged cells flush "waste" more efficiently and slow premature aging. Film-forming properties help it act as a barrier. As for the scent, it&apos;s clean with a hint of... pepper? and vanishes quickly. 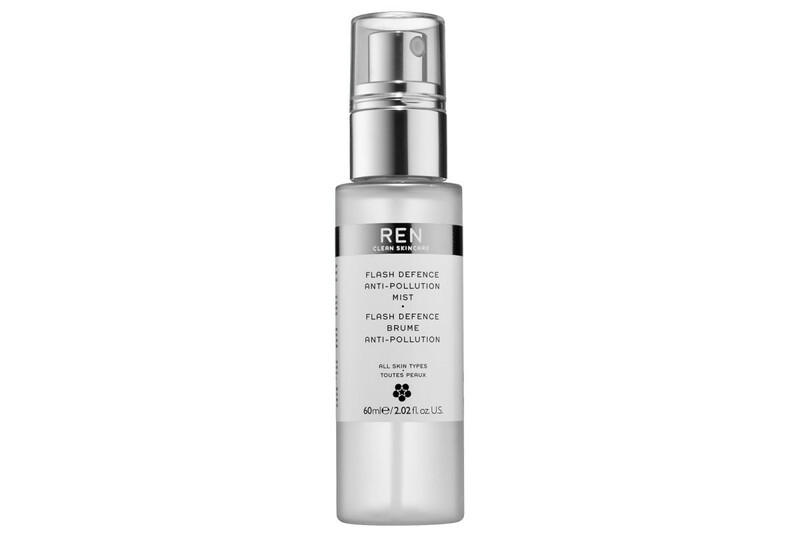 REN Flash Defence Anti-Pollution Mist ingredients: Water, Undaria Pinntifida Extract, Propanediol, Caprylyl/Capryl Glucoside, Hydrolyzed Candida Saitoana Extract, Lactic Acid, Parfum (Fragrance), Polyglyceryl-5 Oleate, Sodium Cocoyl Glutamate, Biosaccharide Gum-4, Glyceryl Caprylate, Citric Acid, Phenoxyethanol, Sophora Japonica Flower Extract, Sodium Hydroxymethylglycinate, Sodium Benzoate, Potassium Sorbate, Ethylhexylglycerin, Benzyl Salicylate, Citronellol, Linalool. Dry complexions in particular should benefit from Tatcha Luminous Dewy Skin Mist ($58 CAd and $48 USd at sephora.com), a moisturizing mist that includes glycerin, squalane, antioxidants and anti-inflammatory ingredients. I assume the cyclopentasiloxane, a lightweight form of silicone, is about creating a silky texture. It&apos;s been around a little bit, but I haven&apos;t tried it yet. It&apos;s whispering that I should plan our first date when the humidity levels drop. At that price for 40 mL, though, I hope it picks up the tab for dinner. Have you tried it? Tatcha Luminous Dewy Skin Mist ingredients: Water, Glycerin, Squalane (Olive Origin), Cyclopentasiloxane, Propanediol, Triethylhexanoin, Camellia Japonica Seed Oil, Inositol (Rice Extract), Algae Extract, Sericin (Silk Extract), Glycyrrhizaglabra (Licorice) Root Extract, Oryza Sativa (Rice) Germ Oil, Camellia Sinensis (Green Tea) Leaf Extract, Chondrus Crispus (Redalgae) Extract, Panax Ginseng Root Extract, Royal Jelly Extract, Zizyphus Jujuba Fruit Extract, Thymus Serpillum (Thyme) Extract, Scutellaria Baicalensis Root Extract, Polyglyceryl-2diisostearate, Ppg-5-Ceteth-10 Phosphate, Trideceth-12, Sodiumlauroyl Lactylate, Sorbitan Stearate, Ethylhexylglycerin, Behenyl Alcohol, Glyceryl Stearate Se, Fragrance, Sodium Hyaluronate, Alcohol, Phenoxyethanol. Aside from the cute packaging, this Korean facial spray caught my attention with the words "aqua gel." Too Cool for School Aqua Gel Mist ($25 CAd and $20 USd at sephora.com) is yet another one-that-got-away from my most recent sephora.com episode. I&apos;m already a confirmed fan of Too Cool&apos;s Egg Cream Mask; how could I not have a crush on Aqua Gel Mist when it promises a deliciously hydrating good time? Next shopping spree. Yup. Have you tried it? Do you think it&apos;ll like my oily, dehydrated skin back? Too Cool for School Aqua Gel Mist ingredients: Water, Rosmarinus Officinalis (Rosemary) Leaf Water, Peg/ Ppg-17/6 Copolymer, Dipropyleneglycol, Propanediol, Butyleneglycol, Phenoxyeth Anol, Ppg-26-buteth-26, Peg-40 Hydrogenated Castor Oil, Chlorphenesin, Gellan Gum, Trehalose, Calcium Chloride, Sodium Citrate, Disodium Edta, Hydrolyzed Adansonia Digitata Extract, Carbomer, Fragrance. Of course these are only a basket-full of what&apos;s out there. 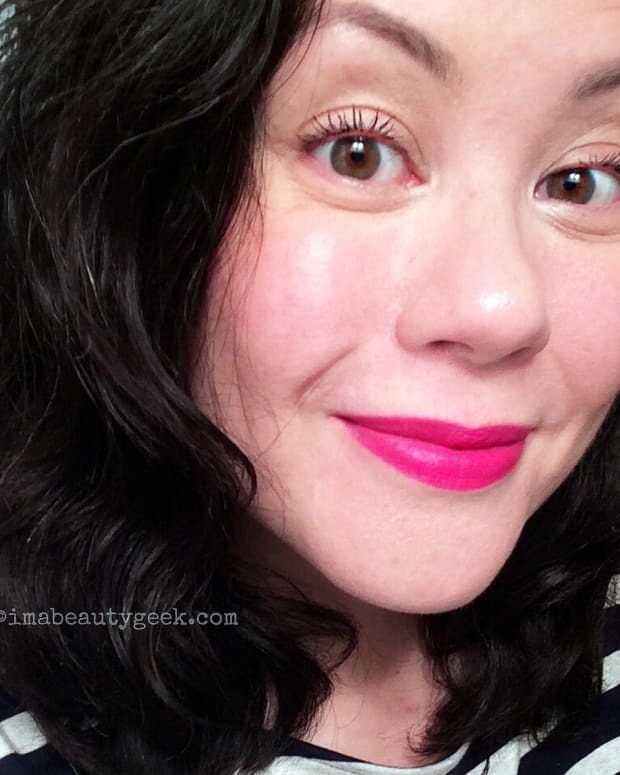 Maybe you&apos;d also like to check out the face mists Jen at MyBeautyBunny.com recommends? If you don&apos;t already use a face mist, are you considering it now? 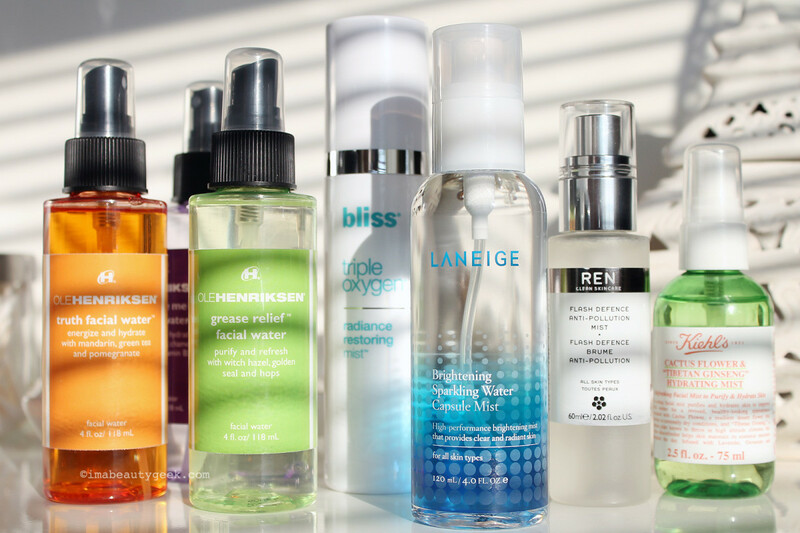 If you do use face mists, do you have a favourite? Or does something new in this list call to you?